A 2000 pound animal graceful? Are you kidding? 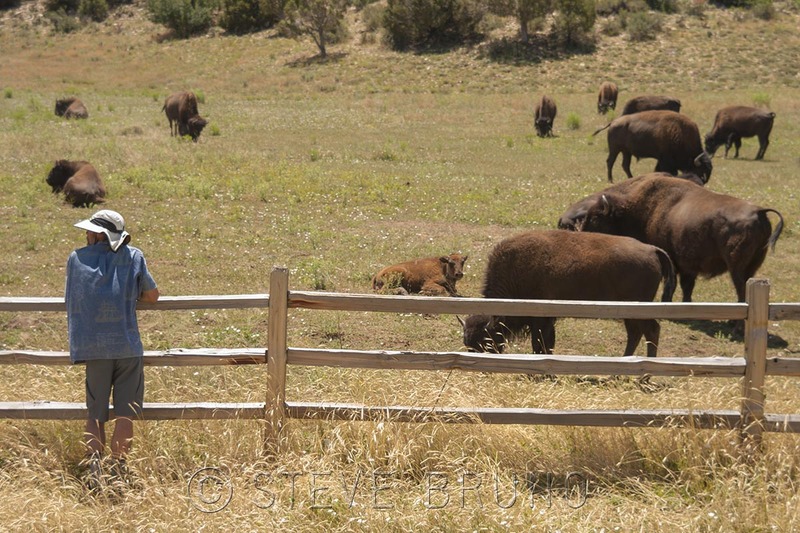 There are 2 places in Arizona where you can find buffalo. One of them, House Rock Valley Ranch, has no fences. The Grand Canyon, Kaibab Plateau, and Vermillion Cliffs all form a natural perimeter. With that much land to cover, don’t expect coming here for animal sightings. On my first visit to House Rock Valley, I had my brother and his daughter along. She got excited when she saw the sign about the buffalo ranch, but we let her know about the vastness of the property so her hopes were not too high. We drove many miles out to where we set up camp overlooking Marble Canyon, then drove back slightly for another overlook. When we came across a road junction which we had crossed not more than an hour before, there were 5 buffalo standing in the road. Collectively, they easily outweighed my vehicle, so we just sat and watched. After a minute or so, they got bored with the standoff, and started to move along the side of the road. We drove slowly beside them, and then they picked up their pace. We matched them. They continued to pick up their pace, at which point I noticed we were driving 35mph. We were on a fairly smooth road, they weren’t! After about a minute of running with the herd, they peeled away until we lost sight of them. A few years later I returned to House Rock Valley. This time was specifically to cover the buffalo, and unfortunately, it was hunting season. The herd’s numbers are maintained, and only a handful of permits are issued each year. These buffalo know when it’s hunting season, and become scarce. 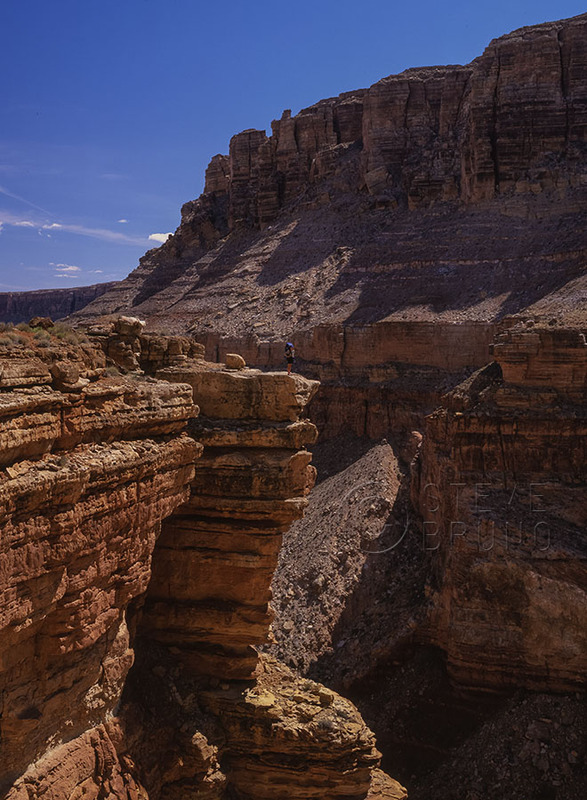 Rising from the valley at about a 45 degree angle, the Kaibab Plateau has some twisting, sheer walled canyons. The buffalo traverse these canyons like bighorn sheep, and the hunters can’t follow. I met with the manager of the ranch, and he was full of information about these animals. One story he relayed was about the animals’ ability to leave no trace. There are no reliable water sources here, so they have placed water tanks about in several spots. In hunting season, the buffalo will enter from one side, then step on a rock or clump of grass, get their drink, walk around to the other side of the tank, all the while being selective as to where they step, and not leave a track within ten feet. Is it any wonder these animals were so revered by Native Americans? When I shot with a film camera, I always used the slowest, finest grained film. I would mostly shoot in the early or late parts of the day, and when moving water was the subject, this meant getting a blurred, dream-like effect. I always thought this was a magical look to the waterfalls or streams. I’ve been to many national parks and other special places in the country, but there’s one place that has always stood out. In the Havasupai Indian Reservation in the western part of the Grand Canyon, you will hike a canyon that is similar to the others in the region, but once you come to the first of many waterfalls, this canyon takes on a magical feeling. For this week’s Daily Post Challenge of Magic, waterfalls in Havasu Canyon. This week’s Daily Post Challenge theme is Mirror, and as with many bloggers, I have photos of calm bodies of water. Who can resist pointing the camera towards nature’s reflections? Those weren’t the only ones I came across, and I realized I have more of these than I initially thought I would. Here are some of my favorites. I usually had my camera along with the dogs out for an excursion, and in these shots, I noticed some reflections. In modern buildings, the glass surfaces almost always offer a mirrored image, and here are a couple favorites from Calgary, Alberta. With that much volume of water in motion, large rivers seem like an unlikely place to find a mirrored surface. Despite that, early morning on the Colorado River in Marble Canyon in Grand Canyon, Arizona can look like this. In my backyard (relatively speaking), I have a couple spots I enjoy hiking in Red Rock Canyon, where I came across these mirrored surfaces. One of my favorite places that I’ve ever hiked, West Clear Creek in Arizona, usually has a breeze moving through the canyon. Early mornings can be very calm, and pools can be glasslike. Mountain lakes with reflections appear to have proliferated my files without me being aware of it. Here are some in that category. One image that always made me look twice was this one from Coyote Buttes. There is no water or reflection here, but I felt like the illusion was there. I have one photo of an actual mirror. This is the MMT (Multiple Mirror Telescope) at the Whipple Observatory on Mount Hopkins, Arizona. During daylight, this telescope dish is tilted down and pointing northward. This was around the summer solstice, and at sunset, when the sun was at its furthest point north. As I walked by, this cool mountain air had a hotspot about 20 degrees warmer from the sun just grazing the edge of this dish array. I can’t imagine the destruction if this thing were aimed in the slightest degree towards the sun. Finally, a little bit about the featured image. That’s Saguaro Lake, on the outskirts of Phoenix, Arizona. It’s usually a crowded place, especially in summertime. This happened to be in winter, after a couple days of rain. It’s a fairly sizeable body of water, and this reflection has to be a rare moment, and the absence of people, even rarer. This photo will always have a special place in my memories. It was the first one I ever had published. This week’s Daily Post Challenge is Opposites, which presents many possibilities. The above shot was taken on the Navajo Indian Reservation, and doesn’t need an explanation. Not far from there, I spent a day at the Grand Canyon where it was fogged in. At one point its opposite, complete sunshine, made an appearance on the distant cliffs. When you have a positive and negative charge, you get a spark. Opposing charges created in the magnitude of a thunderstorm produce lightning. In northern Michigan, land and water come together in a serene setting. The start of autumn in Jacob Canyon, in Kaibab National Forest, northern Arizona. Photo by Steve Bruno. There are places where it seems you have to fight for elbow room to get your photographs, nowadays. Most national parks come to mind, but even those have room to venture about, unless you’re looking for that classic shot. In autumn, places like the Maroon Bells in Colorado, and Oak Creek Canyon in Arizona are just as packed as any national park in peak season. I’ve always liked finding hidden gems, and this place, Jacob Canyon, certainly comes to mind. In between Grand Canyon, Zion, and Bryce, there’s little chance of it becoming a destination for many. 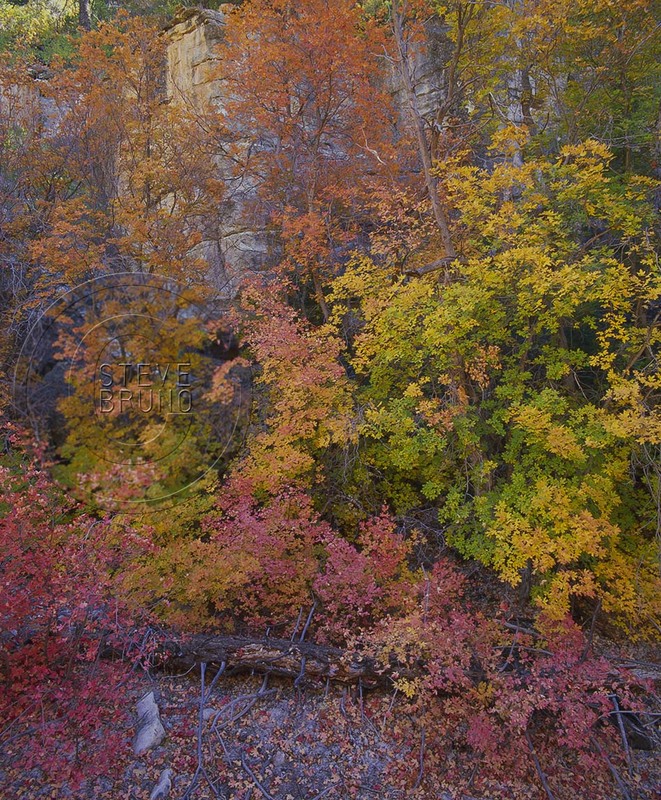 The canyon runs for some distance, and is a great place to just get out and walk in the fresh air. The area that the leaves change is quite condensed, as the forest is dominated by ponderosa pines. To me, its main beauty is that I can have the place to myself most days of the year. As I travelled through airports last week, it occurred to me that the image I wanted for this week’s challenge was right in front of me. Of course I’m talking about the post 9/11 boundary that makes getting to the airport early a necessity. It seems that it wasn’t very long ago that greeting arriving guests at the gate was the norm. Nowadays, not even the bottle of water you’re consuming in front of security can pass this boundary. 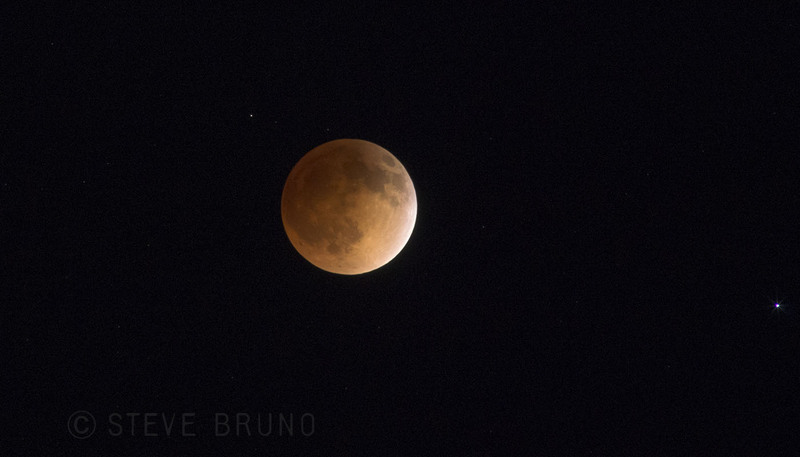 I’ve had a little time to go through other shots in my files, and have found a few more that seem to fit the challenge. Once believed to be beyond our reach, we’ve set foot on the moon. Even though that has been a few decades, we continue to further our exploration of space. Human minds pushing their current boundaries of the understanding of science will be the reason we might eventually reach beyond our solar system. As much as our minds have the potential to break boundaries, some choose to believe in limits, which are often self-induced. 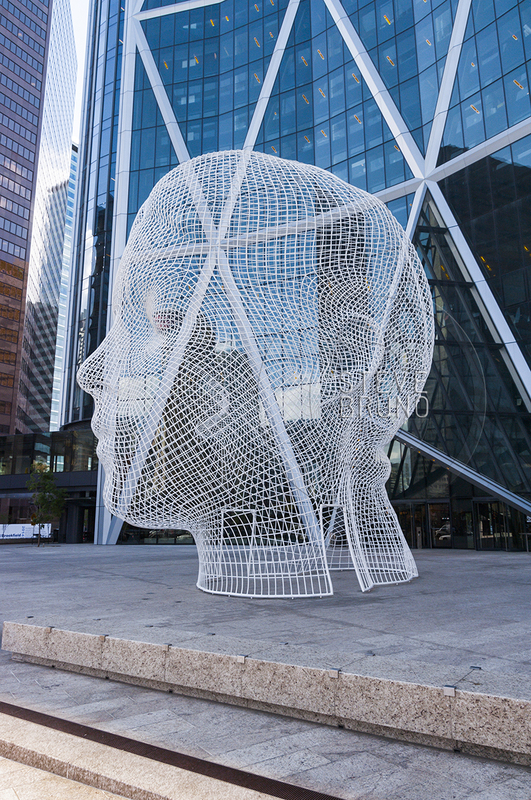 Photo of sculpture in Calgary, Alberta, Canada. This one doesn’t need an explanation. There’s no need to go beyond this boundary. How much closer do you need to get? Lastly, if you look closely in the center of the shot, you will see a hiker at the canyon rim boundary.